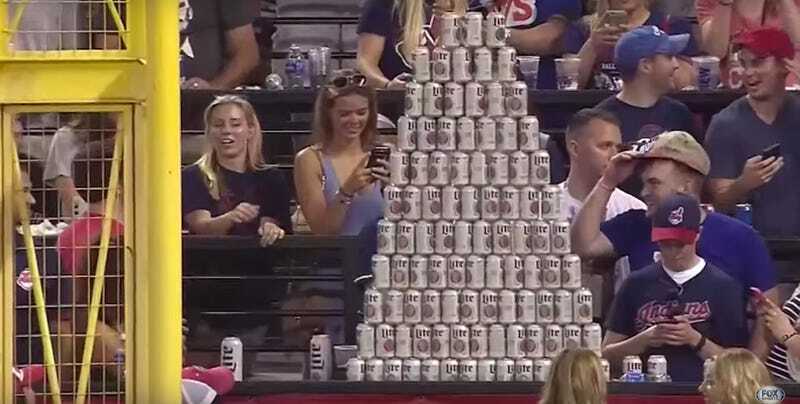 MLB On Colossal Beer Pyramid: "Wow"
What separates man from beast? Humans are weak-skinned bipeds, but our great advantage in this life is our bigass brains. We build. To engineer is human. That’s how we survived in the jungles and took over this planet. Read one way, the story of human history is a long, inexorable march towards the construction of baseball stadiums. Which brings us to last night in Cleveland, where it was $2 beer night. A beer is a beer, but a beer can, well that’s building material. To the fans who built this 112-can tall beeramid, we salute you. Cleveland stadium staff, of course, took it down, probably because it was a more impressive edifice than the stadium which housed it. Humans are vain creatures. The official MLB account had this to say on the /r/baseball post regarding the beeramid. MLB, we can agree on this much: wow indeed. h/t to the anonymous tipster who sent in this video.